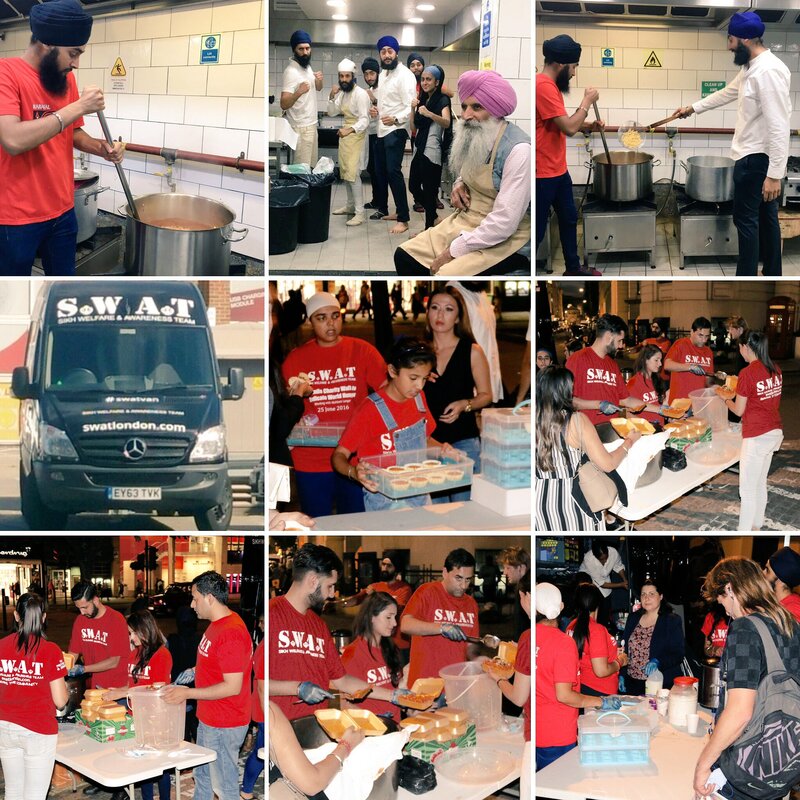 The Sikh Welfare and Awareness Team (SWAT), a charitable organisation based in West London, aims to financially help disadvantaged communities in various parts of UK. Their core purpose is the support of the homeless and displaced living on the streets of the UK. These people are self proclaimed ‘ghosts of society’, they are there but no one wants to see or engage with them. SWAT's short to medium term vision is to make the life of a homeless or displaced person more comfortable, by providing food and warm clothing; their long term vision is to completely eradicate homelessness in the UK. SWAT currently serve up to 2500 hot meals every week from 14 locations with 20 sessions. They have a volunteer network of over 800 volunteers, many of whom are there to provide emotional support and take time to engage and spend time talking to them to make them feel valued, cared for and special and all others who take part in the serving of food and the distribution of warm clothing, including sleeping bags and blankets. OKA are very proud to donate a cheque for £10,000 to help towards the purchase of a new building for SWAT to operate from. They are currently renting but feel the need to lay their foundations as they have grown rapidly over the last 10 years. We presented the cheque on Sunday 17 February at the Strand, when many members of One Kind Act team were present to serve the food to the homeless who come every week to be fed their daily nourishment. OKA made a further grant of £500 to fund the feeding on Sunday 17 February. A grant of £2,000 has been made to fund 100 sleeping bags and 100 hats and gloves for the homeless. A grant of £1,460 has been made to provide a supply of biscuits to over 200 homeless people. A grant of £1,663 has been made to provide a supply of biscuits to over 200 homeless people. A grant of £2,200 has been made to fund 100 sleeping bags and 100 hats and gloves for the homeless. On Sunday 29 January 2017, a dozen OKA affiliates and Sponsors, Meera & Harry Bhogal, joined SWAT for their regular slot in the Strand to feed the homeless. Hot food, dessert, cake and hot drinks were distributed along with blankets, scarves and hats to almost 200 deprived homeless. It was a particularly brutal day with icy driving winds and heavy rain. Everyone was huddled under hooded jackets, handing out food, trying hard to be upbeat and joyous. However, an OKA trustee looked sorry enough to be mistaken for one of the homeless and was promptly offered compassion and a warm meal! Despite of, or perhaps because of the weather, the homeless continued to stream through for almost two hours, grateful for the food, blankets and the warmth of volunteers who clearly cared about them as individuals. SWAT not only feed the homeless in UK through their volunteers' fundraising efforts, but also do other wonderful work like providing maternity care support for mothers in poverty in Kenya. On one of the warmer evenings in May we’ve experienced this year, members of the OKA committee gathered at the Strand to offer help to an amazing charity SWAT (Sikh Welfare & Awareness Team). Initially set up as an organisation to primarily unite and transform financially disadvantaged communities, SWAT recognised in 2009 a desperate need to attend to so many people sleeping rough on the streets of London. It was then that they established their "Homeless Project" to reach out and feed the less fortunate in all different areas of the UK. London brightens up noticeably in periods of fine weather, no doubt apparent on that sunny evening in May as we noticed a greater bustle and liveliness on its streets. However, balmy weather does not disguise the real hardships of the homeless, who struggle daily without food and shelter. This uncertainty prevails throughout rain or shine. This was abundantly clear as we witnessed a queue of around 200 men and women waiting in line to be given their daily meal. We felt privileged that we could help. With an assortment of drinks, snacks, pre-prepared food and pizzas donated by the Pizza Express chain of restaurants, we were able to help alleviate some of their despair. In particular, one woman stood out. 8 months pregnant, she expressed immense gratitude for her next meal. She had nowhere else to go and though she was likely to be admitted into hospital for the birth of her child, she was under no illusion that she would return with her new-born to the unforgiving harshness of the streets of London. It saddened our hearts to hear this and we, as associates of OKA, felt humbled to be able to help. A grant of £100 per month for 1 year (Total of £1,200) has been made to provide monthly supply of biscuits to up to 200 homeless people.